Received Date: March 17, 2017; Accepted Date: April 10, 2017; Published Date: May 29, 2017. Background: An estimated 229 per million population ,are afflicted with end stage renal disease in our country. Chronic kidney disease poses a health threat and financial burden on patients from developing country like ours, where 70 % of the population are from rural areas which make them economically vulnerable group. The number of these patients who opt for renal transplant as an option to renal replacement therapy is uncommon by virtue of this very fact. Methods: A Study in tertiary care government hospital in South India .Our hospital has an outpatient department of 35,616 patients annually. The inpatient statistics are 2564 .Our hospital is the only one of its kind in the country. It is also a tertiary care where renal transplants are done as a renal replacement therapy. The aim is to study the incidence of chronic kidney disease, and the number of them who have opted for renal transplant as a renal replacement therapy from among the patients who are undergoing dialysis at our institution for end stage renal disease. Results: On an average the total number of cases of CKD 1254 cases per year which includes both dialysis and non dialysis patients. Out of which 426 are cases of end stage renal disease on dialysis. The later patients are then systematically screened for economics of transplant with aid from the government of Karnataka and compliance quotient. In the end the total percentage of patients from the group of end stage renal disease undergoing transplant is about 7 %. Conclusion: The incidence of chronic kidney disease is ever growing however the number of patients who opt for renal transplant is a small number especially in developing countries like ours. The constraints are many beginning with economics the dynamics of transplant and patient compatibility amongst others to name a few. 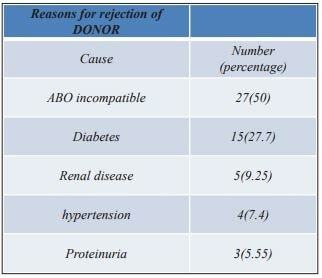 The major barrier to transplantation is money and availability of live related donor. This discrepancy widens between the rural and urban population who are in need of renal transplant. There is limited data on the incidence of chronic kidney disease in our country also the number who opt for transplantation and finally get transplanted are even lesser. 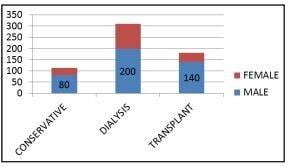 Keeping this into account this a study on the incidence of CKD in tertiary care hospital in south India the proportion of them who opt for renal transplant. This is a prospective study on nephrology patients in our nephrology services department with end stage renal disease and on dialysis. The Aim of the study was to study the incidence of chronic kidney disease, the number who are in the End Stage Renal disease(ESRD), among them number who opt for renal transplant as a therapeutic modality. Subjects with newly diagnosed with CKD were recruited in the study period from Jan 2015 to December 2015. The diagnosis was based on clinical evaluation, imaging studies including ultrasound, and estimated glomerular filtration rate (GFR) calculated using the abbreviated Modification of Diet in Renal Disease (MDRD) equation .The subset of them who were diagnosed to have ESRD were evaluated and also who opted for transplant were studied . The prospective recipients and their prospective donors were interviewed separately. The medical and non medical factors that patient or the donor had were also analyzed. Out of 1054 patient s of CKDin the study year , 603(57.21%) of them had ESRD. Out of these,180 (29.85%) opted for renal tansplant .Males represented 420(69.65%) of the 603 patients with ESRD THE most common cause of ESRD in the institute was glomerular 265 (43.94%) followed by diabetic nephropathy 175(29.01%) ,interstial (135(22.38%)and hypertension 28(4.64%). Renal biopsy established diagnosis in about 243(40.29%) of the cases Of the 113 (18.1%) who choose conservative therapy poor finances influenced the decision in 110(97.34%) of them. Among the 310 (49.75%) patients who chose long term dialysis as RRT. Here 290(93.5%) of the 310 patients were fit to be a renal transplant recipient, and finances influenced the decision .. A trend toward older patients choosing maintenance dialysis as a modality of RRT and younger people choosing renal transplantation but it was not statistically significant. Of the 180 patients with CKD stage 5,who chose renal transplant as their modality of treatment , 70 (38.8.%) came for recipient evaluation rest chose to get registered for deceased donor transplantation., among the 110 who chose deceased Donor transplant, 54 chose deceased donor in in view of non availability of ,living donors ,the most cause was ABO incompatibility ,followed by diabetes. Motivated, younger patients ,who had government approved schemes for transplant opted for transplant. Among the donors ,mother were most common (45(64.28%) followed by spousal (all wifes) ,the father and brother. Among them 40(57.14%) were finally evaluated. Chronic kidney disease has become an important health burden to the Indian population. Early detection of renal disease ,prevention and life style modification, prolong life in these patients., There is ever widening gap between the number of people waiting for renal transplantation and those who are transplanted . 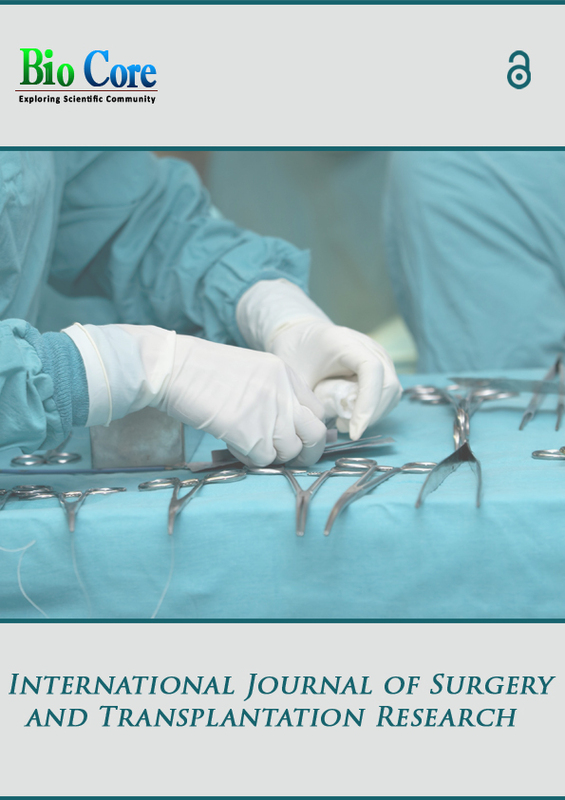 Patient’s choice of the modality of RRT, in our country, is largely dependent on the means of financial support for transplantation followed by donor factors. The males constituted 69.65% of the total population. This was similar to the 69.6% as per the Indian CKD registry.4, It is likely that the incidence of the disease per se is more in males .However, socio economic factors may play a role in their presentation. In a study form south India the prevalence among men was 60- 70 %5. In A French urban area study, the male: female ratio was 2:1 after the age of 20 years onward6. The proportion of male patients among each the three sub groups of ESRD were higher as compared to their female counterparts. Poor Indians spent 40% of their income on health care while the rich spent about 2.4%.7 Studies have shown that medical expenses were one of the main factors pushing people into poverty. Hence it is not surprising that a large proportion of patients chose conservative treatment. In our study population The number of patients who chose conservative treatment, dialytic treatment, and renal transplant were18.73%, 51.4%, and 33.1%, respectively, as against the Indian CKD registry data of 75.1%, 22.5%, and2.5%, respectively4Most of the patients who started dialysis had to continue further hemo dialysis at centre of their own choice, its quite possible that many wouldn’t have continued HD due to financial reasons. Of the 31.7% of the patients who had chosen renal transplant as their modality of treatment, 22.2% of the initial CKD 5 population was left with us for further evaluation for living donation , a large percentage(61.11%) of chose deceased donor transplant as a modality Patients choosing renal transplantation as a modality can be high , due to our center been a referral hospital caters to the whole state of Karnataka and a significant number of patients are referred only for renal transplantation. So our findings are not representative of the general Population. Females were the donors for 85.71% of the recipients. A study from south , India, had reported that two thirds of their donor population were females and this had only marginally changed over the last 10 years8 . The donors volunteered themselves for transplant evaluation in 28% of cases and in the rest, it was requested by the recipient or suggested by the recipient’s physician. Among the patients who were finally evaluated only 40 (57.14%) under went evaluation ,factors responsible were dead of recipient s ,death of donor ,non wailing donors after initial evaluation, lost to follow, change of centre . Renal transplantation is still at a nascent stage in a country like ours. Counseling regarding donation the apprehensions about complications of the renal transplant surgery among the donors to be allayed both for individual donors and the general public and financial aid may help in improving the donation rates. Agarwal SK, Dash SC, Irshad M, Raju S, Singh R, Pandey RM. Prevalence of chronic renal failure inadults in Delhi, India. Nephrol Dial Transplant. 2005;20:1638–42. Modi GK, Jha V. The incidence of endstage renal disease in India: a populationbased study. Kidney Int. 2006;70:2131–3. 3 year cumulative annual report, CKD registry of India. Indian Society of Nephrology Online Resources.Available from: [last cited on 2009 Jul 10]. Mani MK. Prevention of chronic renal failure at the community level. Kidney Int Suppl. 2003;83:S86–9. Jungers P, Chauveau P, DescampsLatscha B, Labrunie M, Giraud E, Man NK, et al. Age and gender related incidence of chronic renal failure in a French urban area: a prospective epidemiologic study. Nephrol Dial Transplant. 1996;11:1542–. Varatharajan D, Thankappan R, Jayapalan S. Assessing the performance of primary health centres under decentralized government in Kerala, India. Health Policy Plan.